Nothing beats adding a piece to your home that is going to score you style points AND help you declutter your space, and this beautiful sliding glass bookcase does just that. Three adjustable shelves make it possible to customize your storage space to your needs, and the two drawers below are perfect for keeping extra cords, cables, and office supplies out of site. 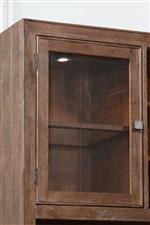 The sliding glass doors give this bookcase a unique look that lets you display a handful of accent pieces that reflect your personal design style. The Hampton Home Office Group Rustic Sliding Door Bookcase with 3 Adjustable Shelves by Flexsteel Wynwood Collection at AHFA in the area. Product availability may vary. Contact us for the most current availability on this product. 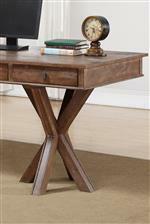 The Hampton Home Office Group collection is a great option if you are looking for Rustic furniture in the area. Browse other items in the Hampton Home Office Group collection from AHFA in the area.